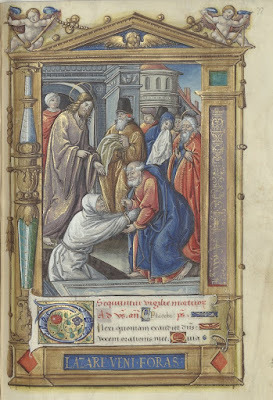 We are grateful to our friends at Canticum Salomonis for their kind permission to publish here on NLM their recent translation, the first ever in English, of part of an important 15th-century liturgical treatise. This treatise offers an interesting critique of the Franciscan influence on the liturgy of the Roman Church, particularly in regards to the Missal and Breviary of the Roman Curia which they adopted, and which are the principal late-medieval source of the Missal and Breviary of St Pius V.
Radulphus of Rivo (d. 1403) was a Dutch jurist, liturgist, historian, and dean of the chapter of Tongres cathedral, whose several works on the liturgy are of primary importance for understanding the development of the Missal and Breviary. His work De Canonum Observantia examines the sources of liturgical authority – Scripture, tradition, canons, papal decretals, etc. – and describes how the Mass and Office should be celebrated in accordance with them. In Proposition XXII, which appears here in English for the first time, he harshly criticises the Franciscan breviary compiled by Haymo of Faversham for departing from the traditional Roman order while claiming to be its only true representative. The piece raises interesting questions about the nature of Rome’s liturgical primacy. 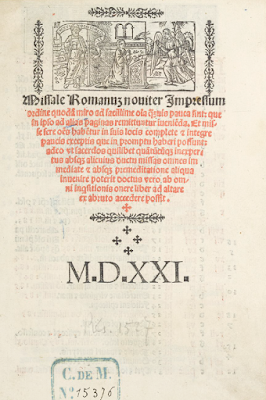 The frontispiece of a Roman Missal printed in Venice in 1520. Although it is not stated here explicitly that it was made for the Franciscans, this is clearly indicated by the fact that some of the Order’s canonized Saints are listed with octaves in the calendar. The Ordo of the Holy Roman Church is to be gathered not from the practices of the Friars Minor but from the canons, the authentic Scriptures, our ancient books, and the general practice of each particular church. Consider also the material under the third proposition above. But in what pertains to the Divine Office, today there is a widespread belief and opinion that the Friars Minor are the only ones who observe the order of the Holy Roman Church, which (they claim) is contained in none other but in their own Breviaries and books. Why? Because in their Rule Bl. Francis prescribed that the clergy should perform the Divine Office according to the Roman order wherever they are able to obtain the Breviaries. During my stay in Rome, I learned that the truth is quite to the contrary. 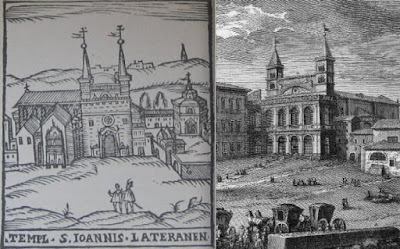 In fact, when the Roman Pontiffs resided at the Lateran, they observed a less complete form of the Roman Office than what was observed in the other collegiate churches of the city. Moreover, the chapel clergy, whether by papal mandate or on their own authority, always abbreviated the Roman Office and often altered it, according as it suited the Lord Pope and the Cardinals to observe it. I also had the opportunity to study an Ordinary of this Office compiled during the time of Innocent III. It is this abbreviated office that the Friars Minor follow. This is the reason why they give their breviaries and office books the sub-title “following the custom of the Roman Curia” (secundum consuetudinem Romanae Curiae), but they have taken no pains to receive and observe the customs of the other churches of the city of Rome. Now if the Chapel Office in question really can be called the ORDO of the Holy Roman Church, then they have done what the rule prescribed. If not, they have not. According to St Augustine (De Civitate Dei 19, 13), an ordo is the disposition of equal and unequal things each in their proper place; and in De Ordine Rerum, II, he says that ordo is that by which all the things ordained by God are done; and in the second book of the same, Ordo is that by which God moves all things that are; and on the Epistle to the Galatians: confusion is the opposite of order. With regard to the Divine Office, therefore, whenever everything is done just as the Roman Church has ordained, and each thing assigned its place as a right judgment deems proper, then we have the ordo prescribed by the Roman Church. And where the contrary subsists, this is confusion. But the other nations and religious orders observe these things more exactly than the Franciscans. Therefore, etc. First, with regard to things that are read and things that are sung, the Lateran and the other Roman churches have sermons and homilies, the Passions of the saints, and other such things in very great number. Likewise the ancient Roman antiphonaries contain [proper] chants for Saints Nicholas, Sebastian, and Maurice; and long responsories for Terce, Sext, and None in Lent; the Sunday Psalms divided for the Vigil [i.e Matins] in Easter Week, Easter Vespers ordered by Kyrie eleison , and several antiphons for the Sunday Benedicite,  and in several places variant antiphons and responsories. (c) Confusion of the local and universal calendars: Adoption of local Roman feasts outside Rome. Further, the Apostolic See desires proportion (between local and universal feasts). Rome observes the (feasts of the) holy Roman Pontiffs and other local feasts of the Holy City; in the same way, others should observe their own local saints in their own local uses. Just as in Rome they are not held to observe our local saints, so neither are we held to observe theirs. But the Friars, contrary to this general custom, which is tacitly approved by this See, have added local Roman saints to their rite, such as Hyginius, Anicetus, Soter, Pius, Cletus, Marcellus, Eleutherius, John, Felix, Silverius, Anacletus, Victor, Innocent, Evaristus, Pontianus, and Melchiades, all Roman pontiffs; the same for Anastasius the martyr on St. Vincent’s day, whose monastery is situated beyond St. Paul’s; Gilbert the Confessor from England, and the Forty Holy Martyrs of Armenia, who have their church near the Colosseum; the Apparition of St. Michael of Apulia; the Martyr Elmo of Gaieta; Rufina and Secunda, virgins and martyrs of the Lateran; Nabor and Felix of Milan; Symphorosa with her seven sons, martyrs from Tivoli; Pastor, priest and confessor, who was a companion of Praxedes and Pudentiana, Roman virgins; Susanna, virgin and martyr, who has a church near the Baths (of Diocletian); the twelve brothers martyrs on St. Giles’ day, where Urban IV ordered that Giles be celebrated as a nine-lesson feast; Cerbonius, bishop of Populonia; Tryphon and Respicius, martyrs, whose church is held by the Augustinians; the feast of (Our Lady of) the Snows; the dedication of the three major basilicas; and Sabas the Abbot, whose abbey is located beyond the church of St. Alexis. It is remarkable that none of the aforesaid Roman feasts have propers in the Gregorian Office, which may be evidence that generally they were not celebrated. Besides what we have just mentioned, in various other calendars of the churches of the city, I have seen other Roman Pontiffs and saints celebrated in many places, as feasts of nine or three lessons, whom the Friars have omitted. In the ancient calendars of the city, moreover, though many local saints are assigned feasts of nine lessons, I have seen very many saints assigned only three lessons. In this, the books of the Friars Minor have been deficient from the beginning, for they did not note which saints are assigned nine lessons, so that they could observe all the others under three lessons. Some of their books, which they admittedly do not use today, assign at most four or six saints’ feasts of three lessons, so that all the others are kept as feasts of nine lessons. And in this regard they oppose all other religious congregations and nations. But about this confusion regarding feasts of nine lessons I have written sufficiently in Proposition XVII above. The Apostolic See has ordered local custom to be observed on feast days of saints, but the Friars observe the contrary in the feasts of the aforementioned saints, as we noted in Proposition XVII. Further, if the Friars observe the feasts of their own order’s saints with major octaves, such as Francis, Anthony of Padua, and St. Clare, who are not found in the Roman office, when do they not leave the Romans some of their own local saints that the Franciscans are not bound to celebrate? Another point to be considered is the fact that Pope Nicholas III, a Roman from the family of the Orsini, who began his reign in the year of our Lord 1277 and constructed a palace at St. Peter’s, ordered the Antiphonaries, Graduals, Missals, and 50 other ancient office books to be removed from the churches of the city, and ordered that henceforth the same churches would use the Books and Breviaries of the Friars Minor, whose rule he also confirmed. This is why all the books in Rome today are new and Franciscan. (g) Disappearance of the ancient chant notation. Therefore, with regard to the Divine Office, we will observe the order of the Holy Roman Church if, disregarding the use of the Friars, we follow the sacred canons, authentic Scriptures, and the more universal local customs (consuetudines locorum generales) and, in points of doubt, the more ancient ones. And in other particulars let us follow the proportion mentioned above in the section on local saints. Translation from the edition printed in Magna Bibliotheca Veterum Patrum, vol. 10, 1149A–1151D (Paris, 1654). “La réduction de l’office divin, accomplie par saint Grégoire VII, n’était destinée, dans le principe, qu’à la seule chapelle du Pape : par le fait, elle ne tarda pas à s’établir dans les diverses églises de Rome” (284). According to Leo Cunibert Mohlberg, “Der Liber De Canonum Observantia,” in Radulph de Rivo: Der letzte Vertreter der altrömischen Liturgie (Louvain, 1911), 66–86, perhaps an Ordinarius a tempore Innocentii III recollectus, containing the office of the papal chapel. Radulphus’s claim, here and throughout, is that the nations of Europe have received the Roman liturgical tradition directly through the books of the Ordines Romani, which represent the ancient local liturgy of the Roman church. Amalarius, the Micrologus, and others, he argues, are conscious of this reception. Further, a close study of the customs current in the Roman basilicas reveals that they retain many features in common with other European uses, while the papal rite has removed or abbreviated them. 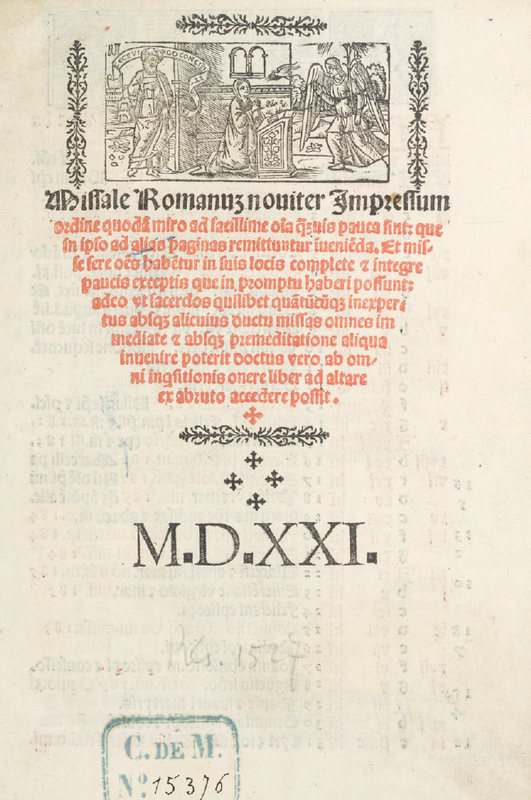 Throughout the De canonum observantia, he appeals to the OR along with papal decretals as a definitive authority on the Roman liturgical tradition. See, e.g., Proposition XXIII, which is a critical commentary on the Order of Mass as found in the OR, comparing it with other European uses. He is referring to the collection of notes or longer works he compiled while resident in the city of Rome, from which he is composing this preliminary treatise. Unfortunately for us, the materials in question either never arrived, or have been lost. See Mohlberg, 78-86. Around the 13th century, the old “glorious office” of Easter Vespers in Rome (as Amalarius dubs it) died out. It used to begin with an entrance procession to the singing of the Kyrie eleison. Radulphus may mean that the Use he is describing has more than one antiphon for the Benedicite (i.e. the Tres pueri), changing from time to time within the season per annum. Radulphus scolds the Franciscans for abbreviating the proper feasts of the saints in “many” ways,” in particular by (1) editorial changes and (2) omitting the ancient legenda. 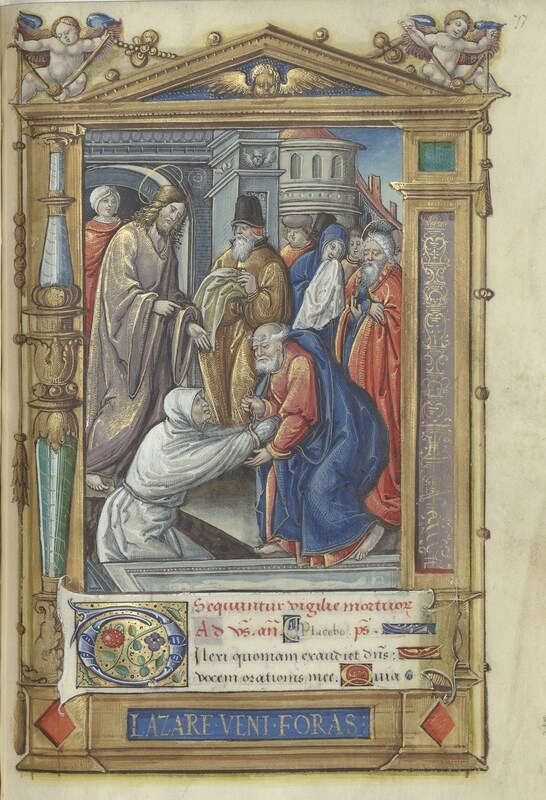 (1) Haymo seems to have rearranged the breviary so that the propers for Saints’ feasts are found in a newly-created Common of Saints containing all the propers in list form. (2) The breviary’s liturgical readings are no longer taken from the legenda, the ancient accounts of saints’ Acta. These legenda varied by region and were often very florid. The Franciscans substituted the Liber Pontificalis, a more sober book that gives short profiles of popes’ lives. The Liber Pontificalis was attributed to St. Damasus. He may be giving two names for the same thing. “Feast of nine lessons” refers to a classification of feasts that does not correspond to the current system. These feasts of nine lessons were the old duplex & semiduplex feasts, now reduced to a single lesson. Feasts of three lessons were simplex feasts, now reduced to mere commemorations with no lessons. Perhaps Radulphus cites this as a token of prudence, since the addition of nine-lesson feasts, which must be transferred, causes confusion in the calendar. But the Tridentine rubrics must have been a bit different from the Franciscan use explained here, because in Tridentine rubrics if a nine-lesson feast falls on a Sunday it would be celebrated and the Sunday merely commemorated (with some exceptions for major Sundays). And likewise, if a feast fell on most octaves the feast would be celebrated & the day within the octave commemorated, except for the privileged octaves (Easter, Pentecost, Epiphany, & Corpus Christi). He means that because so many feasts had to be transferred, it became confusing to know when they would end up being celebrated; hence the “great confusion” mentioned above. The pre-Pius X Roman breviary suffered from the same difficulty. This is probably hyperbolic. Nevertheless, it is true that Matins is the hour most affected by feasts: all the lessons depend on what feast it is; given the confusion caused by transferring feasts, Radulphus says that the Franciscans tend to skip Matins altogether. The Seven Penitential Psalms, said in choir after Lauds on ferial Fridays. Since the Friars seem to have had few ferias, they would seldom have said these psalms. On feasts of nine lessons, all nine Matins lessons are of the feast (except in Lent), taking the place of the ferial and Sunday cycle of readings. Thus, on each of these days they miss out on the 3 ferial Matins lessons. Of course, the first nocturn (the first three lessons) in Matins of a feast of nine lessons is from the Bible: an epistle or Acts or Apocalypse, but one misses out on the ferial & Sunday Scripture reading cycle if one has too many feasts. The Office of the Dead was said in addition to the day’s office on ferial Mondays. The editors aren’t sure what is being argued here. Guéranger says that Radulphus argues that the Franciscans increased the number of double feasts (i.e. feasts of nine lessons), but Guéranger himself believes that Radulphus is wrong in blaming the Franciscans for this. Gregory the Great, who wrote the Gradual. He may be referring to something similar to the situation in the Graduale of the Novus Ordo Missae, where the Common lists a batch of introits, then a batch of graduals, etc., each to be chosen ad libitum. Perhaps to the proper gospels and epistles assigned for ferial Wednesdays and Fridays, which appear in the oldest lectionaries but were not included in the missal of the Roman curia. See chapter XXIII for particulars. Haymo of Faversham (d. 1243), 4th General of the Franciscan Order, issued a revision of liturgical books, which Nicholas III imposed on the city of Rome. “The Roman basilicas, perhaps as a result of Guido’s audience with John XIX, adopted the staff system (red F- and yellow c-line, letter-clefs and custos) and combined it with neumes perhaps best described as simplified Beneventan (for the literary text, however, Caroline not Beneventan script was employed). Compared to the classical forms of Beneventan notation, most of the special neumes and the variant forms of the basic signs are absent. This is the notation used to record the Old Roman chant repertory. It was not, however, restricted to Rome but also used in many churches in Lazio and Umbria (e.g. I-CT 12: facs. in PalMus, 1st ser., ii, 1891, pl.33; MGG1, iv, Tafel 34, pp.835–6) and was subsequently adopted for the earliest Franciscan chant books” (http://www.columbia.edu/~qx2126/upload/2017-09-15/20114pg4.htm).